Two-hour marathon: How it could be done, per Runner's World. Will a Human Ever Run a Marathon in Less Than Two Hours? 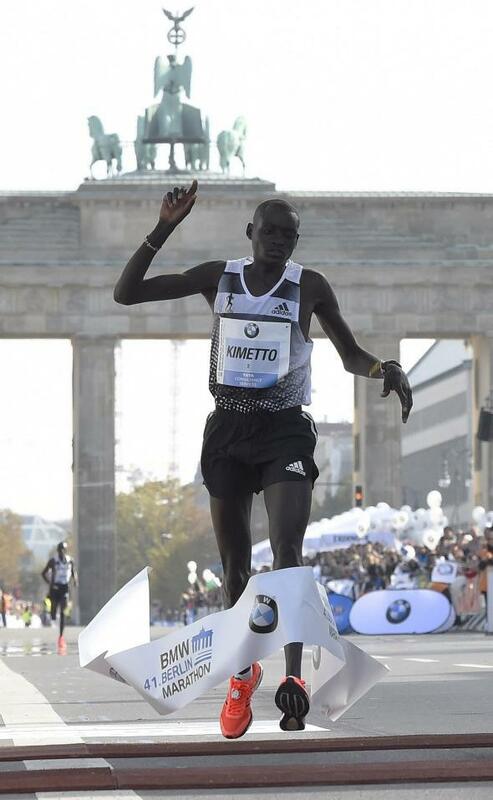 Dennis Kimetto breaking the world record at this year’s Berlin Marathon. Here’s a very cool piece from Runner’s World about the world record time in the marathon, which has been broken nine times since 1998, and is down to 2:02:57 after having previously stayed at 2:06:50 for a decade. The sudden surge has made the potential milestone achievement of a sub-two-hour marathon seem feasible, and Runner’s World asks what kinds of athletes and conditions might be suited for such a breakthrough. Their answers are mostly driven by science and data—they suggest, for example, that elite runners might consider racing more in March and November because their bodies generate enough heat to perform well in conditions that might be too cold for “typical” marathoners. But they also consider softer factors, observing that the marathon was thought to be an older runner’s game until fearless 2008 Olympic marathon champion Sammy Wanjiru won it at age 21 and inspired a number of other young distance racers to move (successfully) into the event. Click here to see the entire piece (and nifty accompanying data visualizations), and mark your calendar for the 2075 race in Saskatchewan that Runner’s World pegs (with tongue in cheek) as the most likely occcasion for the big moment.